Released: June 15, 2018. Directed by: Jeff Tomsic. Starring: Ed Helms, Jeremy Renner, Jake Johnson. Runtime: 1h 40 min. The concept of Tag could sound like the silliest thing ever. It’s literally grown men playing tag because they’ve been playing the game for 30 years and they get together every May to play. The concept only works because it’s true. The film’s based on a Wall Street Journal article called “It Takes Planning, Caution to Avoid Being It” by Russell Adams. The article’s about a group of 10 friends who started playing the game in Spokane, Washington, in high school, but resumed the game again in 1990 at their high school reunion. A main difference of the stars of the article are their ages – average Joe’s in their late 40s – and these characters are thirty-somethings who started the game on the playground. It seems that the film has only taken the concept of the game as our main characters are a core group of five instead of the real-life 10, but this is effective for purposes of simplicity. We first meet Hogan ‘Hoagie’ Malloy (Ed Helms) dressing as a janitor in an attempt to tag his friend Bob Callahan (Jon Hamm). He wants to round up the gang, which also includes Randy ‘Chilli’ Cilliano (Jake Johnson) and Sable (Hannibal Burress), to go to the wedding of their best friend Jerry (Jeremy Renner) to tag the untagged before he retires from the game. We get the exposition that they have been playing the game for 30 years when Wall Street Journal journalist Rebecca Crosby (Annabelle Wallis), the gender-swapped stand-in for the actual article’s author Russell Adams, interviews Bob for an article but follows this story instead. The characters have a nice bond because the game was conceived as a way for them to stay in touch and build their friendships around, and the film surprisingly has a ton of heart. It also shows good examples of fun competition and unhealthy competition, like Hoagie’s wife Anna (Isla Fisher) who is willing to do a lot to find out where Jerry is in town. She’s not actually able to play, but she has a lot of funny, overtly aggressive lines. For me it’s more than grown men just playing a game of tag because it’s about embracing your inner child and not forgetting to have fun. This film’s fun, and the comedy is outrageous for a reason. Characters dress up as old ladies in efforts to tag others, and it’s that much funnier because it happened in real life. The elaborate scenes of characters trying to tag each other are just generally hilarious and it must have been a lot of fun for writers Rob McKittrick and Mark Steilen to figure out these set pieces of them trying to tag each other. They’re super creative. In one scene we get inner monologues of what the characters are thinking as they’re trying to tag Jerry – and Jerry’s monologue is mostly assessing the situation like a military operative. My favourite line of inner dialogue in this scene is from the journalist as she sees a doughnut flying in slow motion: “This is why print journalism is dying.” I was probably the only one who really laughed at this at the theatre, but I thought it was a funny comment on the type of story she’s covering. She does have a point – but it’s articles like the one Russell Adams wrote that make amusing films like this happen. At Tag’s core, it’s a story about human connection and staying in touch. It even got me a little emotional near the end. As for the comedy, the outrageousness of the characters trying to avoid being tagged is what makes this so much fun, and its over-the-top comedy really worked for me. Released: December 20, 2013. Directed by: David O. Russell. Starring: Christian Bale, Amy Adams, Bradley Cooper. Runtime: 138 min. With “American Hustle,” David O. Russell creates a heavily stylish look at the lives of con men and an FBI agent trying to reduce corruption in late 1970’s New Jersey; but ridding the city of corruption might not be so easy when one is working so closely with con men. Irving Rosenfeld (Christian Bale) and his seductive mistress Sydney Prosser (Amy Adams) make their living by selling fake reproductions of great art, and getting checks from people who give them a deposit of $5, 000 who think they will receive $50, 000 in return because Sydney creates an alias (Lady Edith Greensley) where she has connections to British banking. When the pair gets caught by the Feds, Richie DiMaso (Bradley Cooper) says they will get out of it if they help him bring down some powerful people in the government in New Jersey, such as Mayor Carmine Polito (Jeremy Renner). The powerful folk can be tempted by the funding to rebuild Atlantic City. The con artists are led into this world of powerbrokers and mafia that is dangerous, but enchanting. One of the only people who can jeopardize the whole operation is Irving’s wife, Rosalyn (Jennifer Lawrence), who doesn’t appreciate her husband having a so-called whore on the side. This world of powerbrokers and mafia is only enchanting to me because of the style and the cast. Director Russell creates quite the vision with the help of cool hairstyles (maybe not Irving’s combover), tans and cleavage. Russell is a great director, but I do like his last outing “Silver Linings Playbook” a lot better than this. The cast helps keep audience members interested because they’re great screen presences. The plot itself is slowly-paced some of the time, where I just thought it would be a good place to get to the point and bust these baddies already. But no, Richie keeps wanting more people to take down. For some of it, the actors on-screen are some of the only aspects that keep this from being a snoozefest. The character developments are interesting, and I like how unpredictable working with career liars can be. I like the tension between Irving and Richie; it gets created by Richie putting moves on Sydney, who Richie thinks is actually named Edith – her alias. Richie is a bit of a crazy character, who gets in over his head a bit often, and his behaviour might just be better suited for a film like “The Wolf of Wall Street.” Bradley Cooper is showing more and more versatility with each role, so that’s really great. He’s worthy of the Academy award nomination with this performance, but this isn’t winning material. The only other character who might be crazier than him is Irving’s wife Rosalyn. Jennifer Lawrence fits this character because she makes a lot of different kind-of character choices, so the two unpredictable personalities fit. Lawrence is funny as the character, when she consistently starts fires – but more than a bit odd for me when she’s talking about how the best nail polish smells great but has a hint of a garbage smell. The character dynamic between Irving and Rosalyn is interesting because she doesn’t want to divorce him because no one in her family has been divorced before, and Irving doesn’t want to divorce her because he adopted her son. I think Rosalyn’s reasoning is a bit more immature, so she should just take her gross-smelling nail polish and hop on someone else’s dingaling; because they’d both be happier. Irving is trapped in this situation, especially when Sydney would just much rather have him all to herself and get Rosalyn out of the picture entirely. Amy Adams is just great as her character, one who is caught so in the lies that she seems to get lost in her character of Edith; and she gets to sport a great British accent, so that’s fun. I think her true motivations are love, freedom and money. She’s the eye candy for Richie, and there’s so much tension in her and Irving’s relationship because of that. Christian Bale is also great as his character, one who seems honest to his friends and seems like a kind-enough con man. So as you can see, this cast is pretty great. A comment on the only main cast member who didn’t receive an Oscar nomination: Jeremy Renner’s character is easily the most noble of them all, because whatever he does is either for his family or New Jersey. There seems to be an ongoing theme of how everybody has to cheat and lie alittle to get their way. There’s also an interesting theme of reinvention. These characters get so into the role they’re playing that they seem like they might eventually lose sight of themselves. Maybe they like the role they’re playing more than they like their actual self. If you think about it, actors aren’t so different from these con men. I think method acting really utilizes that, when even the actor changes their appearance to fit the character – that’s why I like Christian Bale a lot. He goes through the craziest transformations, like when he was as skinny as a pterodactyl in “The Machinist” and then bulked back up for “Batman Begins.” Now he has a big belly and a combover for this film. I really appreciate when people go so far for their art – as long as they don’t do it too dangerously, because then they might not be around to make enjoyable films much longer. 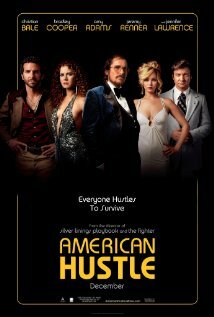 “American Hustle” looks like it will be a great movie, and it has a dynamite cast – it features Bradley Cooper sporting a perm, Amy Adams, Christian Bale, Jennifer Lawrence and Jeremy Renner. It’s the new film from David O.Russell about con artists. Films similar to this open at $13.97 million; and this opened to $740 thousand at six theatres. So, to say this has quite a bit of anticipation behind it is a bit of an understatement! It’s coming to 2507 theatres this weekend, and I think it will do well because adults don’t have many films out right now directly for them. They could also wait for “The Wolf of Wall Street.” My prediction is $19.6 million. 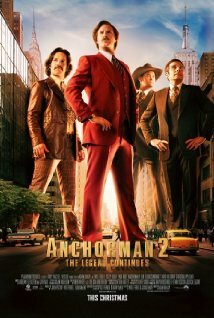 “Anchorman: The Legend Continues” looks freaking awesome! (And it was, expect a review soon!) I’ve been excited for it all year and I was very pleased to find out it’s coming out tomorrow now instead of Friday! I loved the humour of the first and I’m sure I’ll love this. Films similar to this open to an average $31.14 million. Since the first film has established itself as a comedy classic, I’m sure this will do very well over this five-day frame. “The Hangover Part III” mustered $42.6 million in its three-day opening and something like $62 million in its five-day frame, to give you an idea of how comedies over five days do. And even though that was a bad movie, it did well at least in its opening. Sequels nine years apart is never a great thing, but for this it might work out okay – because people love their Will Ferrell and this character. I’m one of those people. The first film opened at $28.4 million, and I think this do near $40 million in a normal three-day weekend, and $54 million in its five-day frame, because even though the opening date was changed to December 18 three weeks ago, I didn’t realize it until today – and I wonder if I’m not alone on that. 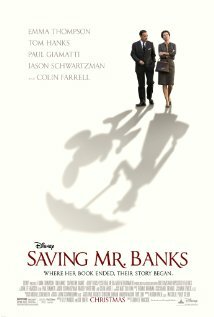 “Saving Mr. Banks” looks like a very moving live-action Disney flick. It looks like an entertaining biography film, and it will really appeal to fans of “Mary Poppins.” It’s a family film that has a lot of competition with “Frozen” as well as the “Walking with Dinosaurs” film also coming out this weekend. My prediction for this is $15.4 million. 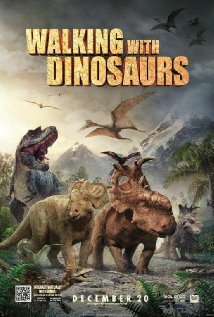 “Walking with Dinosaurs” is the only movie being released this weekend I’m really not interested in seeing. It looks like an incredibly lame 3D sort-of cinematic event for the kiddies. I think the kids will want their parents to take them to this. Dinosaurs are awesome, but this looks boring. Films similar to this open at $25.13 million. “Jurassic Park 3D” opened to $18.62 earlier this year. I think since it is going to 3200 theatres or so this weekend, it will do around those numbers. My prediction is $18 million. What are you most excited about seeing this weekend? Or are you just going to wait for all of those movies being released on Christmas day? Iron Man (Robert Downey Jr.), the Incredible Hulk (Mark Ruffalo), Hawkeye (Jeremy Renner), Black Widow (Scarlett Johansson), Thor (Chris Hemsworth) and Captain America (Chris Evans) make The Avengers. This film is pretty sweet. The Avengers assemble to face off against the god of mischief himself, Loki (portrayed by Tom Hiddleston). What does The Avengers have? Awesome visual effects; great characters; great direction; not the best plot. I can’t think of any other villains that they could have fought against, well villains of these superheroes. Magneto or a Batman villain could have worked, but of course that goes out of their section of villains. I just wasn’t feeling the alien invasion thing. Though, the action was incredible – and it prevented the viewer from becoming bored. 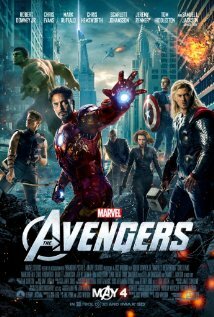 The gags were really funny, Iron Man and the Incredible Hulk added charisma to the film. The film casts a big box office shadow for upcoming super hero films like The Amazing Spider-Man and The Dark Knight Rises, so hopefully those don’t disappoint (I know those have came out, but I wrote this review a while back). The only flaw of the film for me was the villain of the film, but the ensemble that is the Avengers is really great and the action sequences are really well done. I really like the ensemble here, I’ve seen a minority of the films that led up to this (I’ve seen Thor and Captain America: The First Avenger, but still have to see Iron Man 2 – I couldn’t get into the first – and The Incredible Hulk). My expectations were high, from hearing all of the awesome things about it, so I didn’t enjoy it as much as I wanted to. And I also viewed the film in 2D and not 3D, in which it was made for, so that may have taken away from my enjoyment. Granted, the film is still better than one’s average super hero film and was still really enjoyable and not overly flawed.